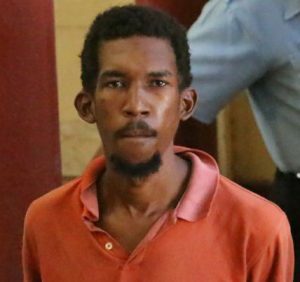 A thirty-five-year-old man who allegedly stole a quantity of meat from his friend was yesterday ordered by a City Magistrate to post $80,000 bail. Kevin Andrews of 11 Sandy Babb Street, Kitty, Georgetown, appeared before Principal Magistrate Judy Latchman and denied the charge which alleged that between November 28 and November 29 at Sandy Babb Street ,Kitty, he broke and entered the shop of Roy Gittens and stole a quantity of meat valued $120,000. It was further alleged that on November 29 at Georgetown, Andrews had in his possession an improvised glass that is used to smoke cocaine. Police Prosecutor Gordon Mansfield had no objection to bail being granted to the defendant. Facts presented by the Prosecutor stated that on November 28 at about 19:30 hrs the virtual complainant secured his shop and went home. On his return to the shop the following day he noticed that the door was open and he made checks in and around the shop and discovered the meat missing. Based on information received, the victim went and reported the matter at the Kitty Police Station and the defendant was arrested. The court heard that Andrews took the Police to where he had the meat and it was handed over to Gittens. The Prosecutor further told the court that it was while Andrews was at the station that the improvised utensil was found in his pants pocket. The court heard that Andrews gave a caution statement admitting that he used the utensil to smoke cocaine. The unrepresented man was ordered to post $60,000 bail on the break and entry charge and $20,000 on the charge of possession of a smoking utensil. He was instructed to make his next court appearance on December 18.